Representation can be a tricky topic for someone who's not a minority to comprehend. In instances like Barber's Sunday night win, it's easy to come across comments online and social media that go something like, "does it matter that she's black?" If being a history minor has taught me anything, it’s that the old saying is indeed true; history repeats itself. The 1960’s is my favorite decade to study. It was a time of revolution, change, liberation, and turmoil, labeled “radical” due to its shifting from old ideas to new. I believe America today can almost be said to be going through, or most definitely heading towards, another 60’s. This is especially evident in the black community. We’re in the midst of a new “Black is beautiful” movement, a time where we’re embracing our “baby hair and Afros” and appreciating our noses “with Jackson 5 nostrils” (shout out to Queen Bey). We have #blackoutday on social media to appreciate how our melanin “pops”. My generation is becoming more conscious of and presented with race and race relations than ever before, thanks to killings of unarmed black men and women being brought to the national forefront in recent years. The Black Lives Matter movement has striking similarities to the Civil Rights Movement that took place over fifty years ago, complete with protests and riots begging for our voices to be heard. Seeing all of these similarities often causes me to wonder if any progress has been made, and if not, when we are going to get over this hump. However, there are still several glimmers of hope for my people. Black women are the most educated group in the U.S.. Beyonce and Rihanna are dominating the music industry right now. Barack Obama holds the most powerful position in the world. 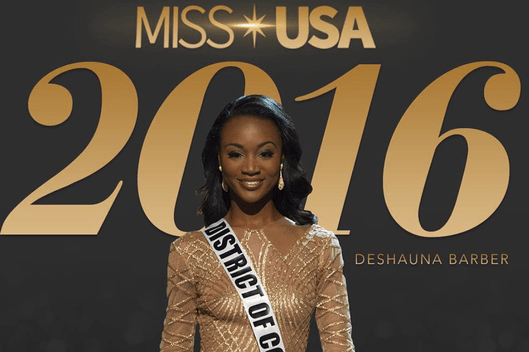 And most recently, Deshauna Barber has been crowned Miss USA 2016. Barber is a 26-year-old Army Reserve officer and IT analyst who hails from Washington D.C.. She is only the 9th black woman to take home the crown in the pageant’s 64 year history. Underneath haters’ accusations of her receiving a biased question and citing affirmative action as the motive behind her win (really? Didn’t we figure out affirmative action doesn’t work, like, 15 years ago? I have got to stay out of the Yahoo! comments section), she was more than deserving of the title. And no one was more proud of her than her people. Black people. Especially black girls. What I believe Davis was saying is that it’s hard to believe in yourself when you don’t see yourself. How hard is it for black people to break the glass ceiling when there appears to be no way out? I can’t imagine the hurdles President Obama had to go through to become the first black president of the United States of America. Or Shirley Chisholm to become the first black woman elected to Congress. Or Gabby Douglas to become the first black woman in Olympic history to become the individual all-around champion. I can’t imagine, but I can thank these people for paving the way and showing and reminding blacks of all ages that anything is possible. For representing this idea for us. I can also go as far to thank the creators of Doc McStuffins, who have allowed little black girls to believe that they can grow up to become doctors one day. Cam Newton for inspiring little black boys to believe that they can possibly lead a team to the Super Bowl. Kanye West (I know, but bear with me) and Michelle Obama for reminding us that even though we came from slaves, we’ve come so far and there’s still further to go. So when you see us on social media celebrating one another and lifting each other up, we’re not being racist. We’re just doing what’s necessary in order to continue to motivate and push our people forward. We’re reminding each other that we are just as capable and our goals are just as obtainable, something that mainstream society often drops the ball in doing. When Prince presented the Grammy award for Album of the Year last year, he said, “like books and black lives, albums still matter.” Well if you’re listening from up above, Purple One, here’s another thing to add to your list: representation.